Since we discovered Clarks Gully-South Hill Labor day weekend 20o7 we make an effort to try and go back every Labor Day weekend. Here are the pictures from Labor Day 2010. Ledges area can be accessed by parking at the top of South Hill. Follow the herd path through the grass to a pine woods. Keep going. You will shortly come to a steep ridge, the Ledges area is directly below you. Take a left and follow the Rim Trail down. After descending the trail it will flatten out. You will see a trail to your left that goes into a lovely Hemlock woods and stream. Five feet ahead of you will see a herd path to your right. Turn right on this path. If the trail starts rising again you have gone too far. If you continue walking straight there will be a steep decline that will end with a spectacular view at a cliff's edge. Be careful as South Hill is noted for steep inclines with loose stones that rob you of traction and can act like ball bearings to move your feet without your permission. The herd path to your right back tracks about 20 feet to bring you into the Ledges area. This area contains dozens and dozens of stone mounds, stone structures, large flat stones. A great place to meditate at. Plenty to explore. 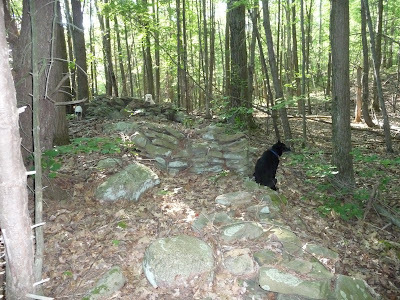 Helen is standing next to a stone mound that is on your left as you enter the Ledges area. Nice. A view of the Welcome circle in the Ledges area looking towards the pond in the background. Pepper in a mound in the Ledges area. We carried out a rusted old wheelbarrow on our way out. Later in the afternoon we drove to the entrance on Wolfanger road and went down the mountain. There are several dozen mounds in this area and the vibe is great. Keepers of the Mound. Part of the gang is sitting on a mound right off a road heading down hill. Notice Pepper the white dog in the hollowed out area in the center. The mound covers 8 or more earth chakras. We believe that this stone mound may have had a keeper, in fact 4 or 5 of them successively, that watched over and maintained the mound. Spiritual pilgrims would sit on the periphery of the stone mound and in the center. I intuited this, but also my dowsing rods show that there were numerous natural vortices of cosmic prana at the periphery indicating people prayed or did ceremony there. Helen sitting on a mound that covers 8 earth chakras and an emanator. The emanator exudes positive emotional feelings of peace and happiness. We meditated here for a while and found it delightful. Pepper sitting on a ceremonial mound that marks the intersection of numerous Ley Lines, or Lines of Consciousness. It is just about a perfect circles. Enlarge the picture to see how the stones are stacked neatly on the right side. 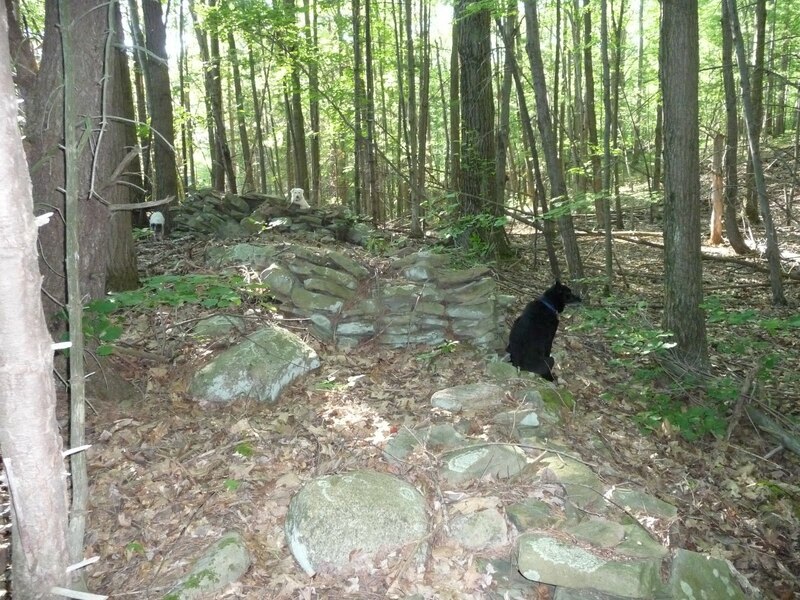 Lucy and Pepper sitting on a stone mound covering earth chakras. Lucy is sitting in what remains of the hollowed center area. 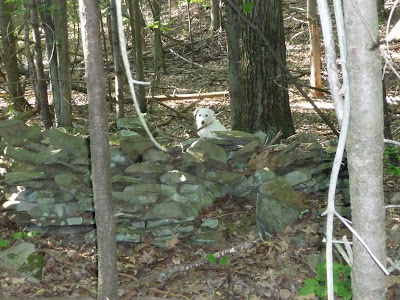 Stone Walls are sometimes made using stones from old Native American sacred sites. Here is a stone wall made from stones stripped from a nearby stone mound. 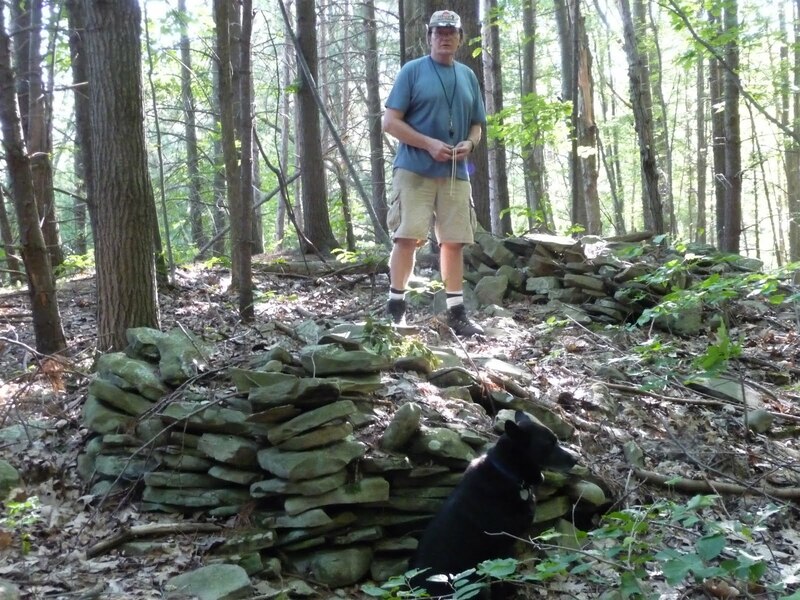 The stone wall was used to cover up a streambed that eventually widens out and deepens. TOO BAD!!! 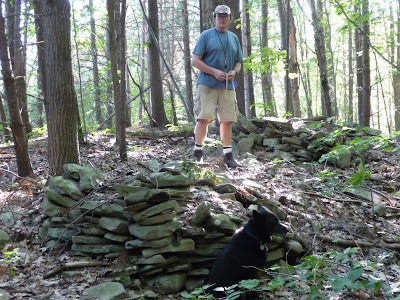 Lorraine and Lucy are standing at where the stone mound once was that was used to create the stone wall-waterbreak. 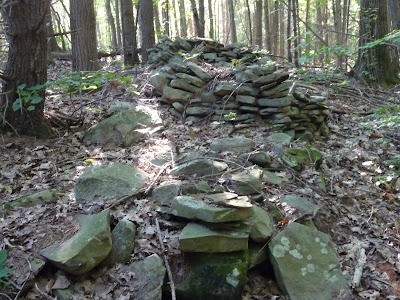 Here is another look at the remnants of a stone mound. Notice how the stones are placed vertically in the earth;this could have been the center area. 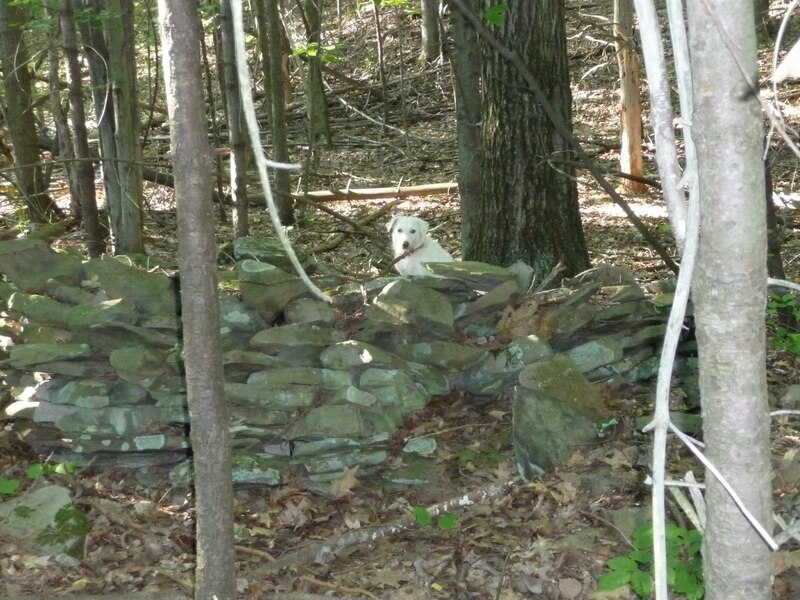 Pepper and my backpack are in the center area of a stone mound that cover 14 earth chakras. Pepper sitting on mound covering earth chakras.